120 pages | 204 Color Illus. 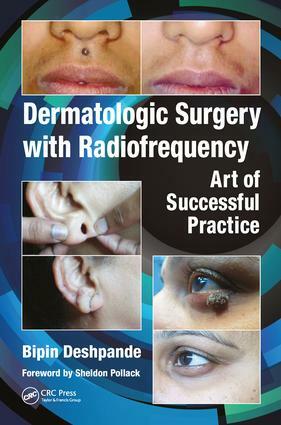 For those who have a surgical dermatology practice, this book makes a persuasive statement for investing in radiofrequency. Those who have already incorporated it into their practice will probably be pleasantly surprised to learn hundreds of other indications for it as well as tips on fine tuning its usage. Dr. Bipin Deshpande, MBBS, DVD, FAAD, has been a practicing dermatologist for 29 years. He is the head of the Department of Cosmetology at Noble Hospital, a leading hospital in Pune, India. He attended St. Vincent’s High School and B. J. Medical College, Pune. He has been an International Fellow of the American Academy of Dermatology for 12 years. He is also a life member of the Indian Association of Dermatologists, Venereologists and Leprologists; Cosmetic Dermatology Society of India; and Indian Medical Association. Dr. Deshpande specializes in cosmetic dermatology, dermatologic surgery, and laser therapy. He has been a pioneer in India in the fields of radiofrequency surgery and photobiomodulation, and he introduced radiofrequency surgery in Indian dermatology in 2000 at the National Dermatology Conference. He also introduced photobiomodulation with the help of the case study article "Diabetic Ulcer Treated by BioBeam 660 Phototherapy" in the Indian Journal of Dermatology, Venereology and Leprology in 1996. He has presented more than 40 original research papers at national dermatology conferences and national cutaneous surgery conferences. He has also presented more than 30 original research papers at various international dermatology conferences including the World Congress of Dermatology, American Academy of Dermatology, World Congress of Family Physicians, International League of Dermatology with Egyptian Women’s Dermatology Society joint conference, DASIL (Dermatologic and Aesthetic Surgery International League), and IMCAS (Internal Master Course on Aging Skin). Dr. Deshpande has conducted more than 50 teaching workshops in India for radiofrequency surgery and one workshop in Cairo, Egypt. He has been a guest speaker at many local, regional, and national conferences. His chapter contributions include "Radiofrequency Surgery: Ablative and Non- Ablative" in the Manual of Cosmetic Dermatology and Surgery published in 2009, and "Radiofrequency and Electrocautery" in the book Procedures in Dermatosurgery: Step by Step Approach to be published in early 2018. Dr. Deshpande was conferred in Who’s Who in Medicine and Healthcare in 2007 and 2009, Who’s Who in Asia in 2007, and Who’s Who in World in 2008 by Marquis Who’s Who. Deshpande has an Indian patent for designing an instrument for facial scar management.